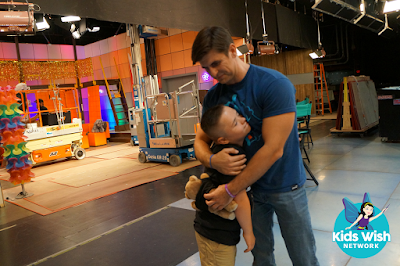 A boy from Detroit, Michigan who faces several life-threatening conditions was able to visit the set of his all-time favorite TV show in Los Angeles, California, thanks to the Kids Wish Network! Blake Lang was born with a hole in his heart. At only 6 weeks old, he underwent surgery to repair it. Challenges kept coming. Blake has Down syndrome, autism, and atlantoaxial instabilities, a separation in the spine that can originate from congenital conditions. Years later, the unthinkable happened. The gap in Blake’s spine dangerously widened after he was hit by a car… nothing remained to hold his back in place. Blake had to wear a back brace and undergo surgery to remove 11 of his ribs and insert a rod. He lost a large amount of blood, and also needed a blood transfusion. He still tires easily from walking, and his family travels from Michigan to Philadelphia every 6 to 8 weeks for medical visits to monitor his progress. Blake’s happiness comes from watching his favorite TV show Henry Danger on Nickelodeon. When he shared with Kids Wish Network that he loves watching the comedy series on Nickelodeon, had no idea that his wish would come true. 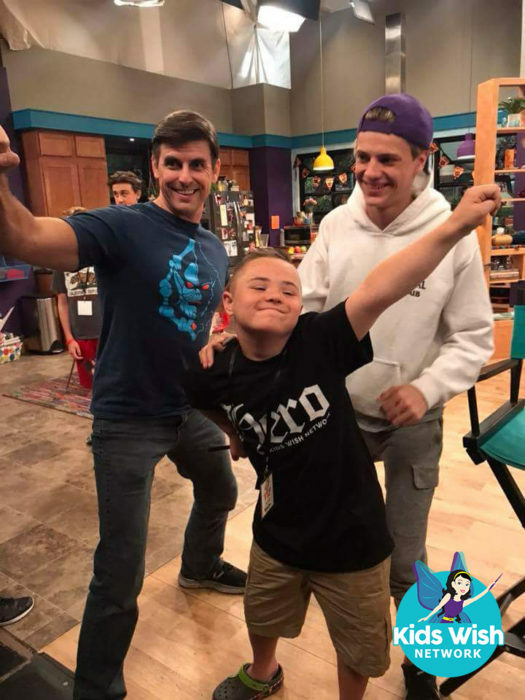 He had no idea that his wish would have him joining his idolized superheroes Kid Danger and Captain Man on the set of Henry Danger! Kids Wish Network flew Blake and his family to Los Angeles. Blake felt like a Hollywood celebrity with all of his VIP treatment. On his big day, Exclusive Sedan Service chauffeured his family to The Burbank Studios. 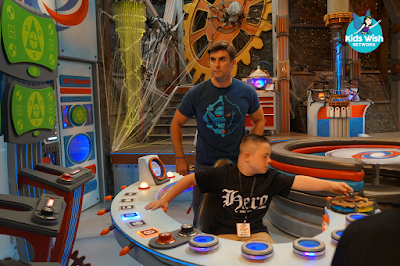 It was lights, camera, action on the set of Henry Danger! Blake was taken through each scene where the actors did their run through. 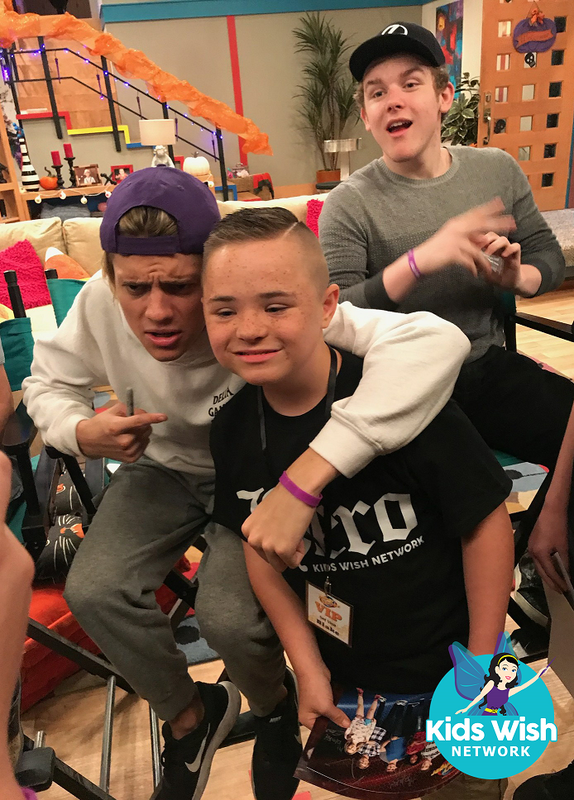 Then Blake excitedly met the stars, took pictures together, and personally received signed photos from Jace Norman (Kid Danger), Cooper Barnes (Captain Man), Riele Downs (Charlotte), Sean Ryan Fox (Jasper), Ella Anderson (Piper) and Michael D. Cohen (Schwoz). Blake also received special mementos… He was gifted a duffel bag filled with Henry Danger merchandise. After seeing how excited Blake was with the “tubes” on the set, Cooper Barnes also thoughtfully arranged for their production team to send Blake clear plastic tubes filled with Henry Danger themed gumballs - the kind Henry Hart and Ray Manchester use to blow bubbles to become their superhero alter-egos, Captain Man and Kid Danger! During the wish, the family stayed at the beautiful Double Tree by Hilton Los Angeles Downtown hotel. They also visited Universal Studios Hollywood, and enjoyed dinners at The Palm Restaurant, Bubba Gump Shrimp Co. and The Hard Rock Café. Check out more photos of Blake's awesome visit to the set of Henry Danger on kidswishnetwork.org! Kids Wish Network would like to thank the following sponsors for making Blake’s dreams become a reality: Nickelodeon, Jace Norman, Cooper Barnes, Double Tree by Hilton Los Angeles Downtown, Universal Studios Hollywood, The Palm Restaurant Los Angeles, Hard Rock Café in Hollywood, Bubba Gump Shrimp Co. in Universal City, Exclusive Sedan Service. For more information about Kids Wish Network and to donate to help grant more wishes for kids, please visit https://www.kidswishnetwork.org.